New Jersey Personal Injury Attorneys | Maggiano, DiGirolamo & Lizzi P.C. If you or a loved one has received a letter from HealthPlus Surgery Center regarding possible infection of HIV or hepatitis from unsafe conditions at Saddle Brook surgery center, please call us before getting a blood test. WE HELP PEOPLE. We are here on a collaborative journey to make our world safer and more just. WE REPRESENT THE PERSON NEXT DOOR, affected by injury or catastrophe. We are here to equal the playing field so that you are heard and compensated for what you have lost. When you come to our firm you’re not getting one person or one lawyer. You are getting a team of 30 people, dedicated to you. WE ARE IN IT TOGETHER. We don’t get paid unless we win your case. We work on contingent fees as personal injury lawyers. We don’t bill by the hour. WE ARE A RARE FIRM. We handle not only the third party case, the injury, who was at fault but also the workers comp. The companion of the two, we believe this maximizes our ability to get the largest result for our client. WE TREAT EACH CASE UNIQUELY. When we represent a client, that client is a unique person. Their case is not just a fall down case, it’s not just a construction accident case. It is a case about THIS client. WE STAND IN YOUR SHOES. When the client comes in we learn everything about you so that we can stand in their shoes and present their case. There is no case too challenging, there is no case too small. Call us, we are happy to hear from you and we are happy to help! Maggiano, DiGirolamo & Lizzi P.C. is a law firm based in Fort Lee, Bergen County, New Jersey. Our firm is dedicated to protecting the rights of the injured. With cumulative experience of over 80 years, we are uniquely experienced in trial law and have the versatility to handle any kind of case, however unique or specialized. Our successes span a wide range of cases. See a few of those cases in our Verdicts & Settlements. We have achieved significant verdicts and settlements in construction accidents involving major injuries to workers caused by equipment failures, product failures, and the negligence of others. We have decades of experience handling major truck accidents and bus accidents involving death, severe brain injury and spinal injuries. Our firm is respected for achieving multi million dollar settlements where death, permanent disability, permanent brain damage, blindness and spinal injury were caused by medical malpractice and surgical negligence. If you need to speak with one of our personal injury lawyers, contact our law office in Fort Lee, New Jersey at 201-585-9111, or contact us today with our quick inquiry form. 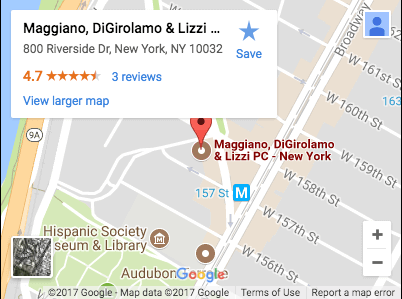 Ron reviewed Maggiano, DiGirolamo & Lizzi P.C. Jay M. reviewed Maggiano, DiGirolamo & Lizzi P.C. One Saturday in April my mother and I were driving to a relaxing afternoon lunch from our home. A careless driver ran a stop sign and smashed our vehicle across the road. My mom and I were badly injured and taken to Hackensack Medical Center for emergency treatment. From there our lives were filled with one medical specialist after another. My mom was disabled and I was unable to continue my studies. My mom hired Michael Maggiano to help us with the so many issues from assuring necessary medical care to bringing an important law suit against the driver who broke the law and turned our lives upside down. You can not imagine the issues and questions that come up. Every single one was calmly and carefully answered by Mr. Maggiano. Every question was accurately solved. I read an article about him on the internet where he was described as the “Detail Man.” That description is just the beginning. He answers questions that you have not even thought about. He sees things far head and deals with them before they happen. He gave us his cell phone number and said if you have the slightest of question just call me. He would personally call us at any hour of any day as it was necessary. Finally we got to court and that is when it all came together. He walked into the court room with his team with the confidence of a person who owned the field. While we were sitting with Mr. Maggiano chatting on a bench outside the courtroom, he was called into a conference with the Judge. At least three different lawyers came up to my mother and me and said that they could not help but see who we were with and told us how lucky we were to be with a “living legend.” Those were the words they used. We had no idea. We knew him as a very kind and thoughtful man who was always there. When the trial started we watched a master at work. He owned the courtroom. The outcome was what we believed to be right and just. If you have been injured by the wrongdoing of another, we highly recommend Mr. Maggiano. BTW when it was all over he told us that sadly it is not over as we required continuing medical care. He told us for any question or need he will always be a phone call way. More than once we had a question. He is always there to help.